Why can't we just let Madea slink off into the far-far away land of unfortunate creations that should have been still born? I for one would give Tyler Perry a oneway ticket on that midnight train to Georgia if it meant that he would never make another Hollywood flick. Oh that's right he lives in Georgia! I've refrained from "Perry-bashing" for a long a$$ time now! When his films reinforced the exaggerated negative stereo-types of black women I sat uncomfortably silent. When his films continued to demonized black men in general I bit my lip until it bled, OUCH! When hundreds of black church congregations across the nation loaded up buses to support his films on false hope, because of the religious overtones I held my peace. Well, no more. While good intentioned as his works may have appeared in the beginning-- offering hope to the disenfranchised, a voice to the misrepresented black female, and calls to keep the faith to those on the fence teetering dangerously-- we know that the road to Hell is paved with good intentions. 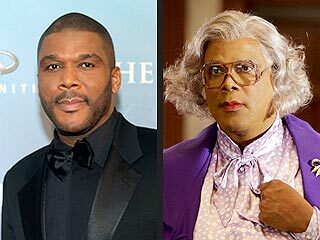 I dare say that Tyler Perry's films have done nothing to add value to the community he often depicts. His peers (filmmakers) don't take his work seriously (and why should they? ), which has a negative impact on other black filmmakers, his body of work has not elevated the value of black talent in the industry, and what message has he sent to aspiring minority filmmakers out there? Bafoonery and contributing to negative stereotypes is the only way to make it? I cannot in good conscious remain mute on this fraud. Mr. Perry shame on you, sir! You can and should DO BETTER! You have the resources, access to talent, and made your fortune so there is no excuse to keep shaming a whole race of people. My message to those that keep supporting this mess: We wouldn't tolerate it if these films were made by Cameron or Spielberg, so Perry shouldn't get a pass either. And to his biggest supporter, Ms. Winfrey- just stop! You know this man means no good. I believe his efforts can single handedly undo what Dr. King and others fought and died for, he's a real threat. Because, far too many blacks have already drank the Kool-Aid.